1 Kung, 1 bäddsoffa och utrustat kök, 4 pers. Detta är en av de bästa egenskaperna på stranden med ett fullt utrustat kök. Fantastisk utsikt över havet, BVI och St. John. Promenad från vardagsrummet till uteplats och du är rätt på stranden för att gå till Karibien eller poolen bara 20 "bort! Restaurang på plats på Sapphire Village bara uppför kullen eller besöka Red Hook för nattliv, shopping, restauranger, eller ta färjan till St. John, alla 5 minuter. Om vattensporter är din valda aktivitet småbåtshamnen är bara mindre än en två minuters promenad och boka en fiske- eller vatten turné utflykter eller bara koppla av på stranden eller vid poolen, snorkla (rev mitt i bukten) utrustning och annan utrustning finns. Njut och koppla av rätt på stranden! Köket är full storlek apparater. Beautiful place and great beach! We spent the week looking for better snorkeling, but always ended up at the condo beach, sapphire. The stay was everything we expected. Some things are still being reconstructed from the hurricane, but still in great shape. Our unit was typical you may find in a major resort area. First floor walk in the front door and a bathroom is on the right, then walk thru bedroom area, then kitchen/living area. Walk out the back door and find a small covered patio with view of pool area straight ahead. Beach area is about 100ft to left. Marina about 100ft to right. Everything worked in our unit. King bed was okay.... mattress is very soft and spongey. Also mesquites are very annoying. Condo was great. The pool was ok with the eyesore of a past pool bar and falling apart gazebo . We have been going to St. Thomas since 2004 and were amazed at the views and decided to buy the condo. The hurricanes of 2017 devastated the islands, but they came back rather quickly. However, due to a shortage of contractors and supplies some areas still need attention mainly non tourist areas. The restaurant/bar and snack bar (about 100 yds. North of the condo) reopened after renovations were complete in Dec 2018. The owner hired a crew from Chicago since they could not find contractors on island. There are plans to reopen the pool bar in 2019, but island time is real and not sure when it will happen. We have been there several times and have not really paid attention to the pool bar. 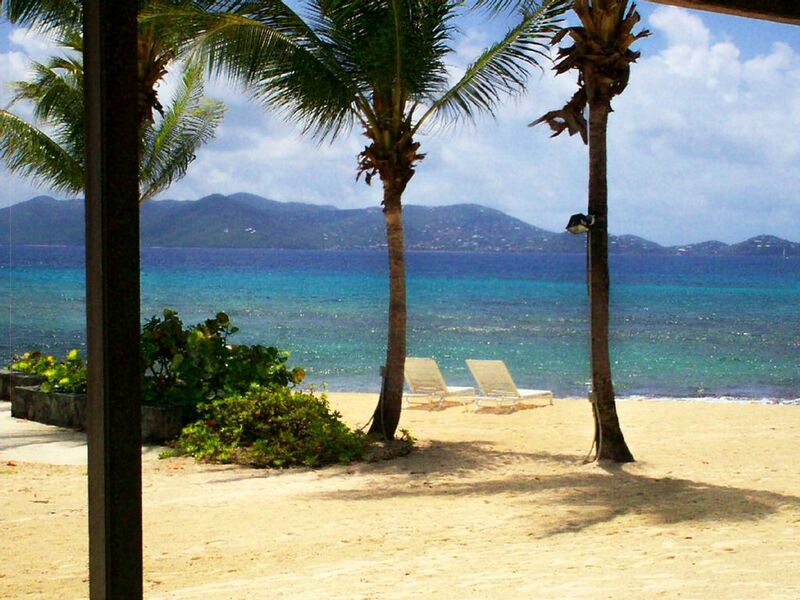 The views of the BVI, St John distract from the pool bar. We have had 50+ guests since the pool bar was damaged and have not had one comment about the damage. I guess the views of the Caribbean are focused on first. Best view on the island. Great condo. Good fit for 2 people. Good snorkeling. Steve is available and helpful if needed Had an AC problem, which was resolved as quick as possible. Gave it 4 stars because pool area including pool huts, have not been maintained. Parking lot has lots of big holes. Looks like the Condo association has not maintained the outside of the complex. The association is responsible for the exterior of the buildings and the AC units, owners are responsible for the interiors. The exterior of the buildings have been completely redone over the past 4 years. The AC unit went out when the guest first arrived and the association found out they had to replace the entire compressor which took a couple of days. The parking lot, grounds, pool hut and all things that are not part of the physical buildings is owned by a private individual who developed the property. The association is working with him to try to get him to maintain his property. It has been a long process but the out buildings are starting to be improved. There is a new bar/restaurant that opened Dec 2018 and a new shop that sells supplies, breakfast items and smoothies that opened the same time. This condo is everything advertised and more. The view IS TO DIE FOR and a perfect location to enjoy the island. I was in love from the second we arrived to now, even after I’ve arrived back home. I did not want to leave. The bed is comfortable, the AC cool, the views are perfection and the ocean and the pool are steps away! Just absolutely perfect! We will be back for sure! We always are glad our guests enjoys the condo as much as we do....this response is shared by other guest that have stayed with us. We had an amazing time at this condo. Everything was very clean and bedding was comfortable. And you can’t beat the view!! We always enjoy that our guests have a great time and the views are amazing! Sapphire Beach ligger på den prestigefyllda East End of St. Thomas med spännande ön nattliv och restauranger i närheten av i Red Hook. Rankad som en av de bästa vyer och stranden på ön St. Thomas. Flera andra stränder och shopping inom några minuter bort med taxi, färja, eller båtutflykter. Se till att vara en av de bästa karibiska semester någonsin! There will be a full refund if cancellation is 60 days prior to arrival. There is not any refund if the cancellation is 30 days or less prior to arrival.